The Enterprise is thrown back in time to 1960s Earth. Air Force Captain: What is it, Webb? Technician Webb: A blip, sir. Just came on the screen. Air Force Captain: How do you read it? Technician Webb: Aircraft of some sort. By the size of it and the speed, it's not one of ours, sir. Doesn't even read like anything I've ever seen. Air Force Captain: What was the approach? Technician Webb: None, sir. It was just there, like it fell out of the sky or something. 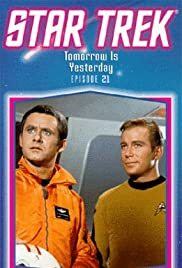 Tomorrow Is Yesterday introduces the most classic of Star Trek plot devices: time travel. After the original series, it was also used in the spin-offs (minus prequel show Enterprise) and three of the eleven - so far - Trek movies (The Voyage Home, First Contact and J.J. Abrams' reboot), always to great effect. This episode is no exception, especially as it gets more fun to watch as time goes by. The travel itself is actually just an accident: when a mission goes wrong and hostilities ensue, the Enterprise flies towards the Sun and then away from it as quickly as possible. This, the so-called "slingshot effect", causes the ship to end up orbiting Earth - in the late 1960s! Unfortunately, a pilot working for NASA notices the ship and is taken the hostage by Kirk and Spock, who must now come up with a way to get back home without altering the course of history.